Marina Jijina is a Saint Petersburg born British painter who has an academic background in art. Though classically trained, artistic experiment and non-conformist approach to art have always been at the core of her practice. Through her observations and studies she has become deeply fascinated by vulnerability of the human condition. In her artwork, derived from her original experiences as an artist and academic, Marina Jijina explores different aspects of the human condition by means of creating an infusion of cultural, temporal and visual associations. Sometimes she seeks to reinterpret past traditions, investigating the conflict between self and other in a collision between the ideal and the human. Marina Jijina’s art work has been developing alongside her art related research, both being organic justifications of the creative process. As the result, the artist’s body of work is in constant movement. Marina Jijina has exhibited since 1996 in Russia, Britain, France, Italy, Spain, the Netherlands, Macedonia and U.S.A.. The artist’s works can be found in private collections as far afield as The United Kingdom, France, Iceland, Russia, Italy, Spain, Sweden, Switzerland, Finland and The United States. 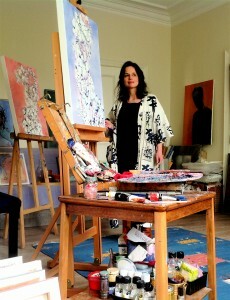 Two of her works are included in the art collection of the world famous artist-musician Brian Eno. In 2016 Marina Jijina’s artwork Jamilia won People’s Choice Award at Competition for the best illustration of Chingiz Aitmatov work in London. In 2014 the artist was awarded World Citizen Artists Competition Winner for her painting Spanish Boy . Since 2015 Marina Jijina has been represented by Cross Design Gallery, France. She is a contributing author to The Oxford Philosopher, The Lev Shestov Journal and a member of the Editorial Board of Cyclops Journal.